MOHAMMED ALI, a.k.a. Aerosol Arabic, emerges from the darkness onto center stage for his 2014 TED talk at the Vatican (available for streaming at aerosolarabic.com). A burly man, he moves gracefully. He apologizes for the way he’s dressed—not in the snappy outfit of a celebrity lecturer, but in jeans, sneakers, open shirt, and a dark, paint-spattered smock. A fleck of white paint punctuates his bearded cheek. Muslim son of Bangladeshi immigrants to Birmingham, England, where he was born, Ali draws a chuckle when he claims his garb is an expression of his religious freedom. He speaks British-accented English clearly, slowly, wasting no words. He will spend only three of his thirteen minutes talking to us. He is only brushing in a background for the performance that is to come. Second, that graffiti art—Mohammed Ali’s own realm, where public spaces, walls, cars, and any flat surface can be transformed by swaths of color from aerosol paint cans—is “necessary for human development.” This is so, he tells us, because graffiti art is the “vehicle for ordinary people to tell their story,” from cave paintings and ancient hieroglyphs, to script from Pompeii and in Roman catacombs, to today’s swirling signatures in subways and on boxcars and overpasses—all signs of people spontaneously “communicating from deep underground in the concrete jungles we live in.” And not just alienated youth, either. “When you’re on the phone and have a pen in your hand, what are you doing?” Ali asks, smiling. He pointedly leaves the question unanswered. Third, that the story such art tends to tell across the ages is one asserting universal human values otherwise obscured or eroded by ideological uses of images—uses that enforce social obedience and conformity with elitist agendas. Ali names three of these eroded values: freedom, justice, and peace. These are not empty ideals for Ali, but markers of the ethical thrust of his art. Ten minutes are left as Ali crosses stage left to an upright dark canvas approximately eight feet high and four feet wide. He takes up a spray can and writes the word “freedom” at an angle, waist high. Quickly exchanging cans, he makes sweeping pass after pass across the upper canvas with a lighter paint. What is he doing? He doesn’t tell us. Instead, he says: “There’s something exciting about performance painting.” And then, to prick any possible pretension, he adds: “Slightly more exciting than watching someone doing watercolors.” The audience laughs, captivated by his easygoing but purposeful presence. He reassures them, “This is water-based paint, by the way, so it’s perfectly safe,” and they chuckle again. The performance entails physical effort, and we hear Ali breathing more and more heavily as he continues to spread a gauzy layer of light paint across the canvas. He has to bend and squat to reach the lower corners. There is no more talking, except once, later. Now Ali picks up a pre-cut stencil, sets it high on the canvas, and brushes a lighter paint over it, leaving the unmistakable silhouette of a dome with cross on top. Two more domes follow. Another stencil yields a minaret with mosque beneath. Another minaret and mosque follow. We suddenly have a kind of dawn revealing an interfaith skyline; the swaths of paint and chanted prayer now create a luminous morning atmosphere. Then, on his knees, in the corner, Ali outlines with a thin brush the contours of a face looking up in longing. For what? With a thicker brush, in a bright contrasting blue, Ali writes the Arabic letters of the word hariyah. He translates it for us: freedom. He places the word in the direct line of sight of the upturned face. This word now becomes the center of the painting, the axis around which the rest turns. One minute to go. What’s left to do? 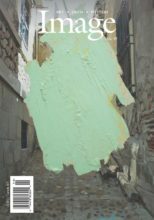 Ali takes a flat piece of wood with a handle, like a plasterer’s tool, dabs it in paint, and slaps smears of pink and blue around the edge of the canvas, roughening the surface, de-prettifying it. Finished, Ali walks off in silence. We remain to wonder what he means by hariyah, and how freedom finds itself surrounded by images of interfaith peace. When Ali tells his TED audience that the visual and aural performances they are about to hear constitute one experience, he leaves open the question: an experience of what? An answer begins this way: this is not merely about the harmony of eye and ear, though that is part of it; even more, this is an experience of harmony between artist and audience, as both envision a world radiating from that harmony. Ali invites us to imagine a world of peace in the midst of a world that seems dedicated to its opposite. That Ali should appear in the TED talk as he does—paint-spackled, apparently in the middle of his workday, as if we, the audience, had somehow wandered into the street where he is transforming a number of otherwise unadorned public surfaces—and then his seeming to disappear from it, as if, having finished one surface, he recalls that he has a date with another farther away—such an entrance and exit seem like deliberate efforts to create the conditions for the audience’s own creative response. The conditions mimic those under which casual onlookers would encounter any graffiti artist in any forgotten part of town. But in order to see why Ali asks us to meet him in such an ambiguous space (public but abandoned, owned and un-owned), we need to understand his attraction to graffiti art. …they weren’t speaking to me. Also, I had been drawn already to graffiti art. As a kid growing up in the eighties, before the internet, I didn’t have access to the kinds of global information about the arts available now. But I did have and was much influenced by the book Subway Arts (1983), from the US. Hip-hop culture with graffiti as its pillar was featured here. I loved graffiti because it was an art born among youth. You couldn’t be taught it. It came up from the streets. By contrast, the great masters didn’t reflect our reality—the reality of kids experiencing marginalization and racism. Graffiti was a free form. 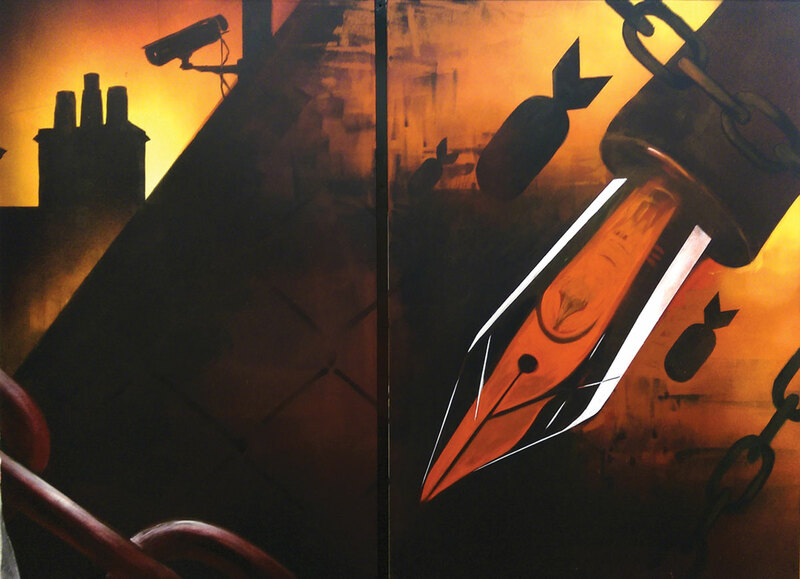 Ali’s love of graffiti art led him to pursue his BA in multimedia design rather than fine arts. He chose multimedia design for a practical reason, too, given its promise of post-graduate employment; he felt compelled to honor his immigrant parents’ desire for financial independence in their adopted country. Ali’s first job after graduation was as a designer of computer games. Later, he branched into web design. By age twenty-four (twelve years ago) he was able to strike out on his own. 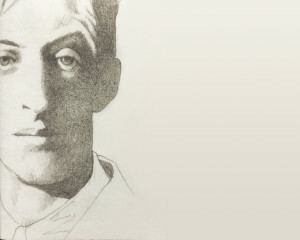 Though he asserted his independence in what might seem a self-defeating way, by spray-painting Islam-inspired murals on the walls of his Birmingham neighborhood, he calculated that that neighborhood, made up largely of first- and second-generation immigrants like himself, would support his efforts, and that in his case, graffiti art would not defy communal authority, but enlist and confirm it. He calculated also that by using his internet skills to adroitly publicize his work, he could find support worldwide. His calculations have proven correct. Ali’s murals can now be found throughout the world, including in Germany, Australia, the Gulf States, Malaysia, and the US. 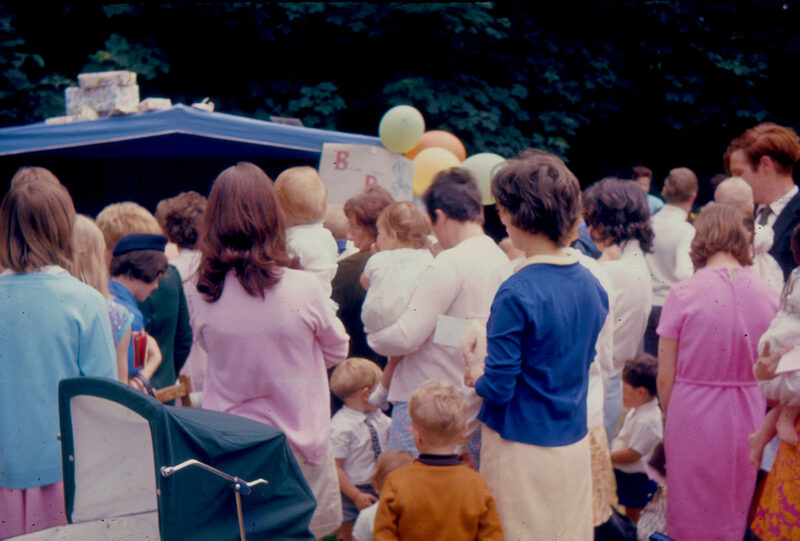 I early on began to feel that my work was becoming limited to one-off displays of rich colors, as in fireworks, where people were expected only to marvel at the spectacle. But after that, what then? People just go back to their own lives. The question became for me: How do I go beyond that? And just as important (or really the same question): How do I bring them beyond that? How do I sustain their experience of beauty so that the experience brings about a shift in their point of view? A shift that enables them to overcome in some lasting way the barriers of imagination that have been sealing them off from each other? PLATE 1. Mohammed Ali. Writing on the Wall, 2009. Spray-painted mural, Birmingham, United Kingdom. 50 x 230 feet. For Ali, graffiti art has never been limited to self-expression. It is primarily a means of communication. It is meant to provoke a direct engagement between artist and audience in a public space where both are freed to imagine a world less trammeled than the one in which they live. In that shared space, the artist challenges passersby to leave off mere spectatorship, even of an admiring kind, and become participants in a common project of peace-building. By working in public spaces, he risks rejection, if not erasure. But only there does the audience’s free, active participation become possible. Passersby may forego their anonymity and bond as a community of participants—not necessarily in the artist’s work itself (though Ali has has allowed for that at times), but more freely and fruitfully in work of their own common invention. This is inventiveness not for its own sake, but for the sake of a world built on right relationships. PLATE 2. Mohammed Ali. 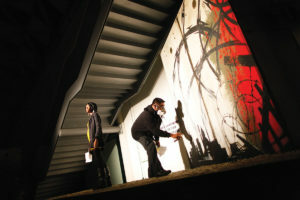 Writing on the Wall, 2009. Spray-painted mural, Birmingham, United Kingdom. 50 x 230 feet. 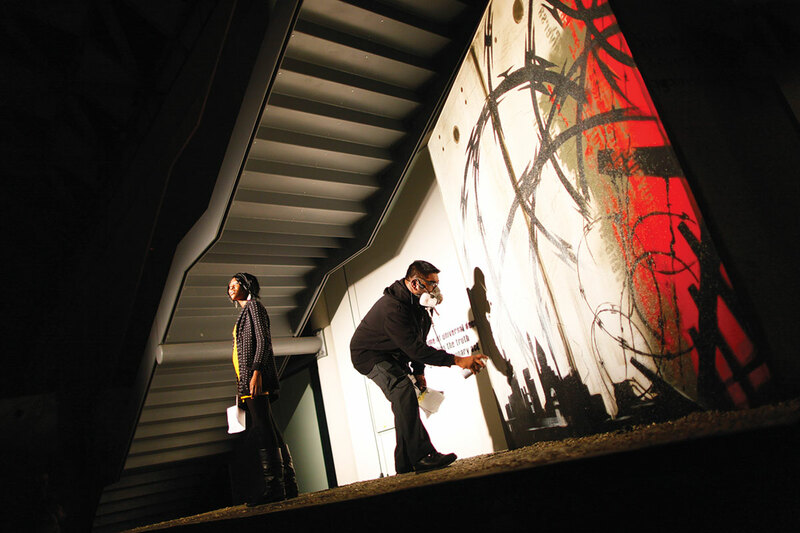 In recent years, Ali’s mission to encourage audience solidarity has inspired him to create theatrical experiences in which his own graffiti-based art blends with other media to invite viewers and listeners into a community. The TED talk gives us a taste of these endeavors, but a much fuller expression can be found in murals like the one Ali painted in 2009 along the long inside wall of a Birmingham theater [see Plates 1 to 3]. Much of this mural was painted in performance in on-stage collaboration with poets and other artists. Its three key themes—announced by the words “love,” “unity,” and “peace” in both Arabic and English lettering—are woven throughout violent images of the bombing of Gaza (in defiance of which a protester is shown throwing a shoe, not a bomb) and contrasting images of Birmingham’s stolid cityscape, home to many who have fled similar violence. Across the surface from left to right a heart monitor reading pulses, then flat-lines (an image Ali drew from his vigil at his dying father’s bedside), giving way to a living fetus (representing Ali’s second son, born soon after his father’s death). 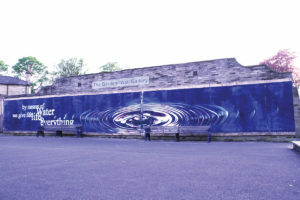 The finished mural expresses its tensions cinematically, and has to be seen as part of the performance that called it forth, not simply as its backdrop. PLATE 3. Mohammed Ali. Writing on the Wall, 2009. 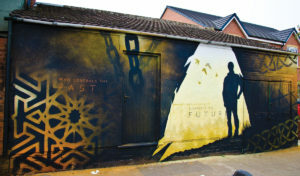 Spray-painted mural, Birmingham, United Kingdom. 50 x 230 feet. 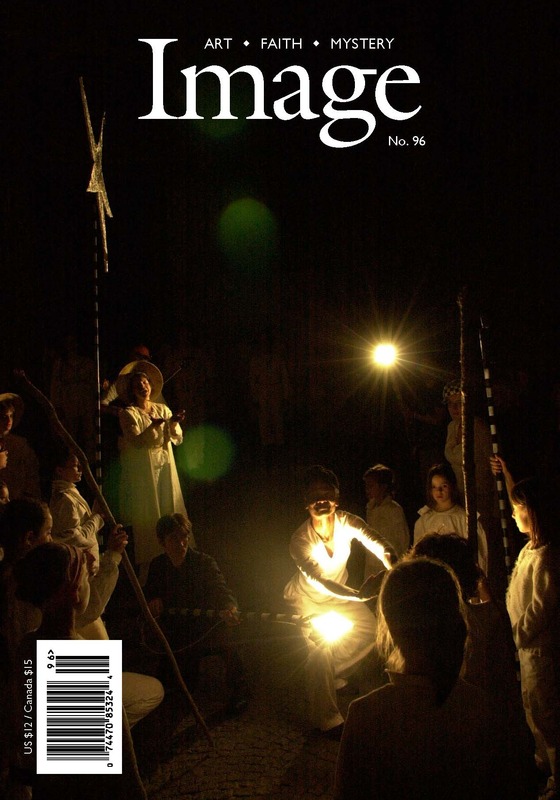 Recently, Ali has been trying to establish a permanent site in Birmingham where, with the help of what he hopes will become a community drawn from people of all faiths and all parts of Birmingham society, he can develop what he calls a “protocol”: a pattern of collaborative response that can function something like a dramatic backbone or liturgical framework for shared creativity. In doing so, Ali seeks to walk a delicate line between guiding and shaping things enough that the protocol can prosper, while at the same time avoiding its collapse into another form of hierarchical control and coercion, like the museum environment from which he has sought to escape. This is the risk of taking a fugitive, illicit art form into the realm of legitimacy. It is a risk Ali accepts as a condition of honoring his and his audience’s hariyah, the freedom either to reject or embrace creative unity, for the sake of the communal peace which is freedom’s goal. What role does Islam play in Ali’s desire to transcend mere self-expression in favor of fostering his interfaith audience’s “one experience”? His faith provides him with the expressive forms of that experience, as well as with the ethical ideals which direct it. Interestingly, perhaps providentially, the maturation of Ali’s faith occurred at the same time as his embrace of graffiti art. If Islam supplied Ali’s aesthetic language and ideal of communal revitalization, graffiti art provided the public vehicle. Islam had always been a regular part of my life, but as an element I more or less took for granted. As for Islamic art—calligraphy, design, architecture—I was not at this time aware of it as such. I thought of it as just part of the environment, not like “real” art in gallery. I was oblivious to Islam’s rich creative history even though I’d grown up in it. That changed when at university, at around age eighteen or nineteen, I first began to question life and its meaning. An old school friend had died. This was a wake-up call. I realized there were no guarantees in life. Islam now became a world I immersed myself in, becoming a definite, conscious part of my life style. I saw other young people coming alive spiritually in ways similar to me, that is, positively—finding ways of integrating their religious faith into their everyday lives. But for others, taking their faith seriously meant cutting themselves off from their previous lifestyles. I struggled with how I should respond. Should I ditch the arts? This was actually not a hard decision for me, though I did smash some of my old vinyls…. I quickly realized there was no contradiction between Islam and the arts. After all—think of the magnificent artistic creativity in the Islamic tradition: the calligraphy, the design, the architecture. I gave a sigh of relief. I didn’t have to go anywhere, do anything different. I was at home here. My first artwork that expressed this union came—it was a lightbulb moment—when I realized that calligraphy married beautifully with graffiti art. The word of God belonged to the people, belonged to the street. It wasn’t only a part of the world of the mosques, and certainly not that of the art museum. 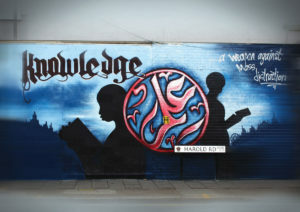 Calligraphy, design, architecture— Ali’s breakthrough consisted in seeing how he could use graffiti art to transport these key elements of Islam’s traditional aesthetic language into public spaces. In doing so, Ali not only makes the words of the Qur’an beautifully visible to all; he also transforms otherwise mute, neglected urban surfaces into architectural elements of what we can call a mosque-outside-the-mosque. “Mosque,” a mis-rendering of the Arabic word masjid, simply means “place of prayer,” and prayer, in Islam, is primarily the hearing of the Qur’anic word. Ali’s graffiti art opens up space for the mosque-outside-the-mosque to offer that word visually to passersby. It is a form of what Christians would call evangelization. PLATE 4. Mohammed Ali. Breaking Down the Wall, 2010. Live art performance. Photo: Salshan Photography. It is essential to note, however, that Ali’s graffiti art is not calling passersby to a sectarian form of Islam, but to Islam in its true, universal dimension. The umma, or community of believers, cannot become a sect or tribe because it must include all who seek to make God’s will their own, whatever their particular religious affiliation or non-affiliation. For Ali, then, as for all believers, Muslim or not, submitting one’s will to God entails hariyah, freedom, not as an end in itself, but as the condition for imagining and then achieving right relationships among conflicting or separated social and religious groups. It was hariyah which permitted Ali’s coming of age as a Muslim artist, uniting for him what had earlier seemed like antinomies or separate realms: first, the art of the mosque and the art of the museum; and second, the Islam of the mosque and the Islam of the world. Ali’s mission as artist has been defined by his realization that “The word of God belonged to the people, belonged to the street.” Graffiti art was the means to bring it there. PLATE 5. Mohammed Ali. God is Beautiful, 2006. Spray paint on canvas. 12 x 60 inches. Finally, Ali’s sense of mission embodies another guiding principle that is much better understood in Islam than in Christianity: the essential role beauty plays in our understanding of God and of what God expects of us. It comes as no surprise that Ali’s early work includes a graffiti-influenced rendering in Arabic calligraphy of the famous hadith (saying of the Prophet Muhammad), “God is beautiful and loves beauty” [see Plate 5]. The hadith articulates a credo not only for the artist, but for all. In Islam, moral beauty and aesthetic beauty are inseparable. Doing good and doing beautifully are one. If the one God is beautiful, there can be no division in the beauty of which God is the source. What Is a “Muslim Artist”? Ali’s mission to encourage the understanding and practice of a universal Islam through art becomes problematic when weighed against the betrayals of that understanding perpetrated over the centuries by Islam’s believers (though surely those betrayals have been no worse than those of a universal Christianity by sectarian Christians). It has become especially difficult to preach such an understanding of Islam after September 11. PLATE 6. Mohammed Ali. 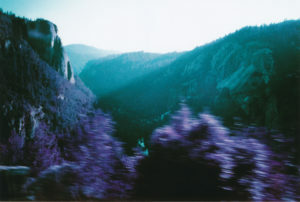 Water, 2010. 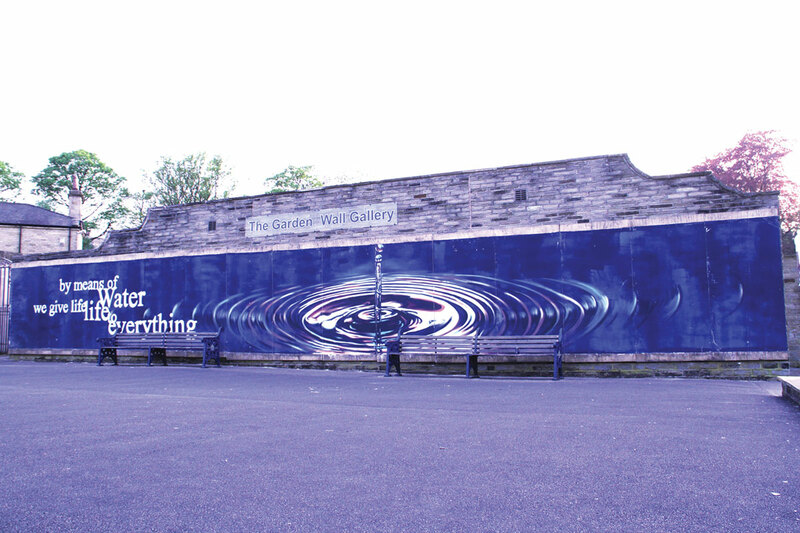 Spray-painted mural, Bradford, United Kingdom. 8 x 60 feet. Clearly, Ali’s artistic practice embodies a religion far distant from the Islam projected by Muslim extremists and demonized by western governments and media. But that distance has been blurred, even erased, by those same forces. Like most Muslims, Ali has had to struggle against the collapse of Islam into an ideology of violence. And like all Muslim artists, Ali has had to struggle against the collapse of Islamic imagery into the brutal sensationalism of the propaganda videos of organizations like ISIS. PLATE 7. Mohammed Ali. Weapon against Mass Distraction, 2009. Spray-painted mural, London. 12 x 30 feet. This struggle is evident in the change in Ali’s art since September 11. 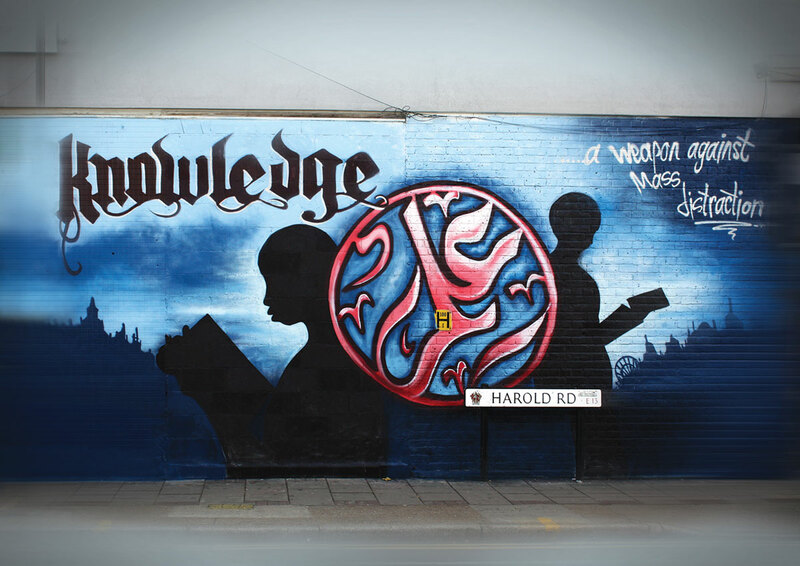 In his earliest work, Ali used graffiti to open horizons of interfaith hope centered on core Islamic values. 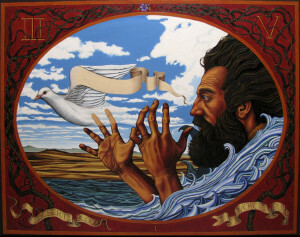 His painting in the TED talk, highlighting hariyah, is an example of the idealistic approach to which he frequently returns. Increasingly, Ali has sought to express the specific challenges of contemporary experience in the light of universal Islamic values. Examples are his recent murals advocating respect for natural resources and education [see Plates 6 and 7]. PLATE 8. Mohammed Ali. Reign of the Pen (detail), 2015. Spray-painted mural, Birmingham. 15 x 13 feet. PLATE 9. Mohammed Ali. The Future, 2015. Spray-painted mural, Birmingham. 9 x 25 feet. Nor can being a “Muslim artist” be an end in itself. An artist’s faith grounds his or her art. It mustn’t imprison it. For the sake of the universal values that transcend sectarian divisions, the artist has on occasion to launch him or herself outside the confines of a tradition—without losing intimacy with it. Ali is as aware as any Christian artist of the risks of such assertions of freedom. But for artists who are Muslim in our era the risks are especially great, because of the stigma all things Muslim now carry. Today, the very idea of an artist who professes Islam would sound like an absurdity to some, or at worst, a cover for an insidiously seductive form of jihad. In Ali’s case, his renown in Britain and elsewhere as an artist advancing interfaith ideals of peace and justice has not protected him from being seen as a spokesperson, however benevolent, for a militant religion. For the British media has often sought him out as such a spokesperson since September 11. His reaction? I’ve grown frustrated by how as Muslims we respond sometimes to news of atrocities committed by other Muslims. Why should I have to comment on the criminal behavior of individuals who have nothing to do with me, and who are Muslim in name only? I still do interviews, but not about terror attacks, and their wheeling out a Muslim to say something in reaction. It’s instead about religion and art, and my approach as an artist dealing with the problems in our society, of how people of different faiths need to engage better, and the lack of spaces to do that. Through his art, Mohammed Ali endeavors to create those spaces, reaching beyond Birmingham to build similar arenas in our own hometowns, hearts, and imaginations. He aims to transform those drab, unused walls that cry out for life and connection, so that, through right dealings with each other, the peace for which we all long may be ours at last.